Synthetic Underlayment | Academy Roofing | Commercial and Residential roofing contractor and repair company in Atlanta. GAF’s Synthetic Underlayment saves the day! It was a typical Spring day in Atlanta, Georgia when we looked at the upcoming weather forecast to schedule a roof. Like so many days, the forecast changes hourly. One day it will show 80% chance of thunderstorms only to then be sunny or cloudy the whole day. Outside of meteorologists, roofing contractors are the second most professionals to monitor the weather so when we schedule a roof it means we believe we can do it successfully without getting water in the home. We checked again the Intellicast.com forecast the morning of production and it looked clear to begin replacing the roof. As normal, we walked around and moved items away from the house that could be in harm’s way for falling debris. We then set up tarps around the house to catch the falling torn off nails and existing roof debris. Our team then began to set up their ladders, secure ropes, and secure them to the harnesses. Each man started tearing off a section and within a few hours they successfully tore off the whole roof. The plywood was inspected and any rotten areas were replaced. 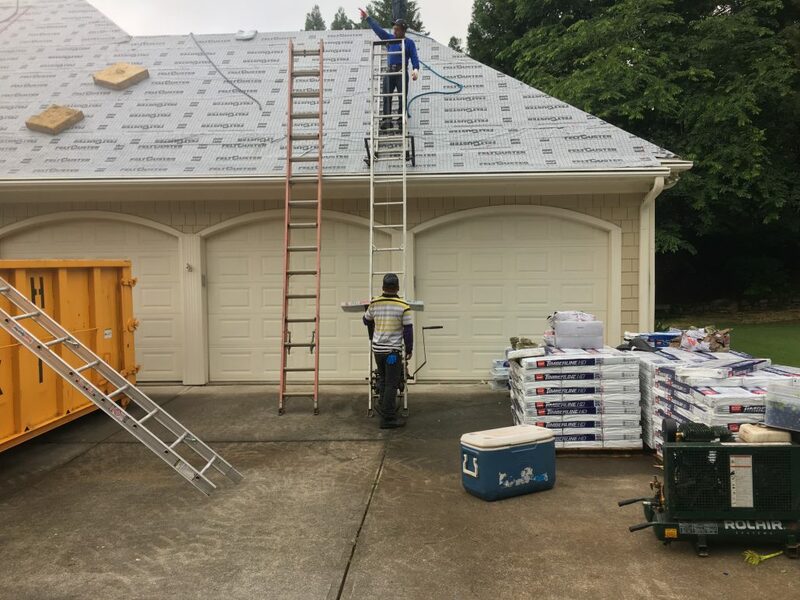 We then installed GAF’s weather watch ice & water shield underlayment in all the valleys and began installing GAF’s synthetic underlayment when off in the distance a rolling thunderous sound was heard. Another quick check of the radar showed a small rain cell developed suddenly which wasn’t forecasted and was headed our way within 30 minutes. Our foreman on site continued to instruct our team to go about drying in the roof with GAF’s synthetic underlayment and making sure all hips, ridges, and the field was covered head to toe. The 30 minutes passed before the first mist was felt. The mist turned into a spitting rain and then a steady rain before the bottom dropped out. Thankfully, GAF’s synthetic underlayment is slip resistant and is designed for high traction so when the rain started pouring, our team was able to safely walk down off the roof with using the ropes and harnesses. Our foreman knocked on the door to gain access to check for any signs of internal infiltration from the rain and the ceilings were dry. It is our professional view that had we not had installed GAF’s weather watch ice & water shield in the valleys and used GAF’s synthetic underlayment, the roof would have leaked severely when the rain popped up unexpectedly. We also believe that our team was able to safely get down off the roof as the synthetic underlayment is slip resistant and has high traction. There are many technological advances today in the roofing industry and we are big advocates of GAF’s synthetic underlayment and ice & water shield. 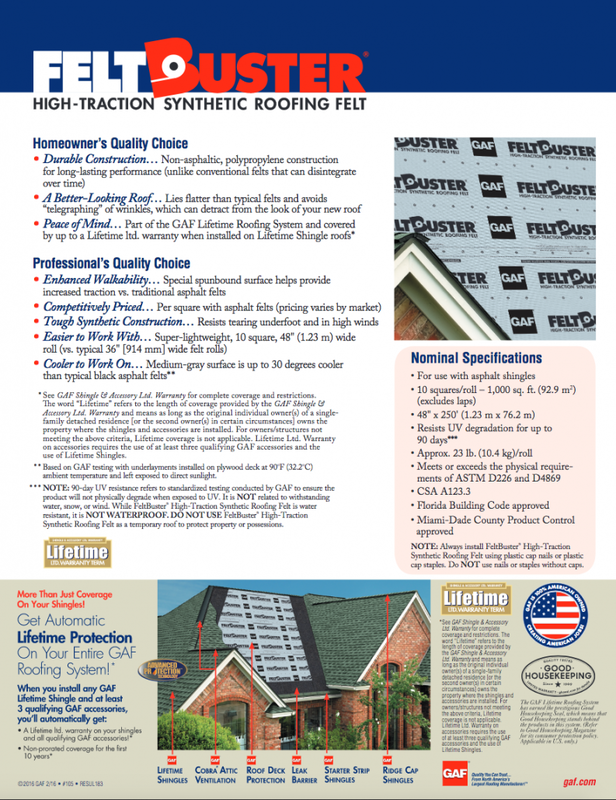 Download the FeltBuster Brochure Here.